The 100-pound cub was freed near the Wisp Resort in McHenry during an annual autumn festival. 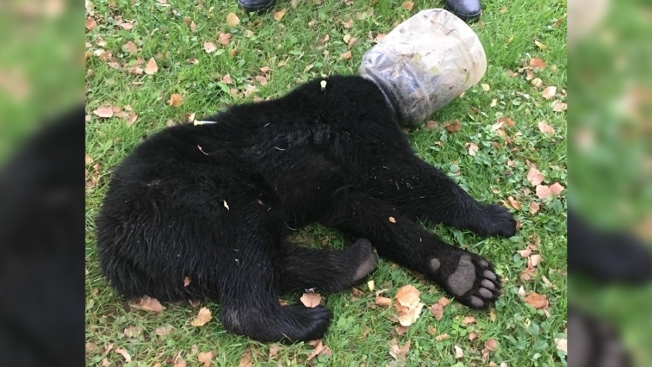 Wildlife officials in Maryland tracked a black bear cub for three days in order to tranquilize it and remove a bucket that had gotten stuck on its head. The 100-pound cub was freed near the Wisp Resort in McHenry, Maryland, during an annual autumn festival, the Cumberland Times-News reported Sunday. A Facebook post shows the cub lying on the grass with a large plastic jar-style bucket over his head. A crowd of onlookers at the resort was giddy to see the cub returned to the nearby woods, the Wildlife and Heritage Service of the Maryland Department of Natural Resources said in their Facebook post. The cub returned to the woods with a female bear and another cub. The Maryland Department of Natural Resources — Wildlife and Heritage Service received help from the Maryland Natural Resources Police in saving the cub.